Your website is your business card on the web. We proofread your online content because there is no greater contradiction than displaying a high-quality product alongside incorrectly written text. That’s why your website should be well-worded and free from errors. 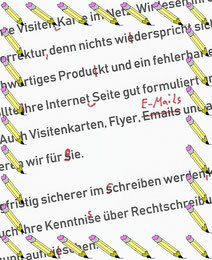 We offer a proofreading service for business cards, flyers, emails and other types of text, too. You can also gain lasting confidence when writing with our refresher lessons for spelling and punctuation.